If your answer is “yes,” you’re in luck! 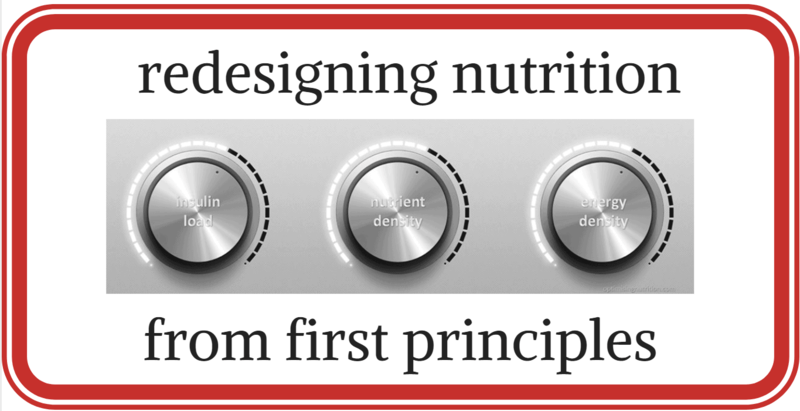 This article sets out a bold proposal and methodology to redesign nutrition from the ground up using first principles. It also gives you a peek under the hood of the Nutrient Optimiser, an exciting new tool to help you identify optimal foods to incorporate into your diet to achieve your goals. But before you dive in, let me give you an overview of where we’re going. the ability to maintain healthy hormone levels. The Nutrient Optimiser algorithm considers insulin load, nutrient density and energy density to identify optimal foods to suit different people with different goals. People with diabetes or some degree of metabolic syndrome are on a blood sugar/insulin rollercoaster which drives appetite and fat storage. Stabilising blood sugars and insulin levels using a lower insulin load dietary approach can help to normalise appetite and improve energy levels and often leads to a degree of spontaneous weight loss. Being able to accurately quantify the insulin load of our food enables us to ensure we invest it wisely on protein and other nutrient-dense foods while still maintaining excellent blood sugar levels. The foods that require the least insulin are typically high-fat foods which may not contain adequate amounts of vitamins and minerals. We need to find the balance between a lower insulin load and adequate nutrient density. Some nutrients are easier to obtain than others. The nutrient density index embedded in the Nutrient Optimiser algorithm prioritises foods that contain more of the harder to find nutrients. People on a low carb or ketogenic diet often miss out on a number of nutrients, particularly electrolytes (e.g. potassium, magnesium, calcium and sodium) and our pancreas will increase insulin levels to enable our kidneys to hold on to these nutrients if we are not getting enough of them from our diet, and thus drive insulin resistance. We can use energy density to manage how filling our food is to suit our goals. For example, someone wanting to lose weight by eating less by decreasing their energy density or someone wanting to eat more by increasing energy density. The Nutrient Optimiser considers what you are currently eating and identifies nutrient-dense whole foods that will provide the nutrients that you are not getting enough of while also managing your blood sugars and weight goals. The Nutrient Optimiser can help retrain people to make progressively better food choices and reduce nutrient-poor processed foods using a quantitative algorithm that eliminates the emotion, belief and conflicts of interest that often derail our best nutritional ntentions. …and we started thinking about having these. My wife Monica has Type 1 Diabetes. Not too long after we got married we started researching how we could optimise her blood glucose control to minimise the risks associated with a diabetic pregnancy. And personally, I have a family history and my own struggles with prediabetes and obesity (as you can see from the “before and after” below). By day I’m an engineer. I like to use data to optimise things quantitatively. I even spent a period of time developing trading systems. In this environment, it is critical to eliminate emotion, belief and confirmation bias. As they say, necessity is the mother of invention. I got frustrated with the lack of useful information for people with diabetes and decided to take matters into my own hands to create the optimal nutritional solution for my family. You may have noticed that there is a lot of argument and conjecture about what is the best diet. Unfortunately, decades of expensive epidemiological studies don’t seem to have provided any clarity. Paleo, vegan, low carb, fruitarian, pescetarian, Mediterranean, vegetarian, plant-based, ketogenic, the list of nutritional camps goes on and on. the ability to maintain healthy hormone levels (e.g. insulin, ghrelin, leptin, mTOR etc.). While not as useful by themselves, we can combine these parameters using a multi-criteria analysis and apply different weightings to each parameter to optimise food choices to suit different people with different goals. Given that the diabetes epidemic is exploding, let me start by discussing how we can quantify the insulin load of the food we eat to optimise our blood sugar control. Someone with diabetes is on a constant rollercoaster of treating blood sugars with insulin. You eat, and your blood sugars go up. You dose with insulin, and eventually, your blood sugars start to come down. Then you find your blood sugars have dropped too low so you feel compelled to eat again. Maybe something sweet or a glucose tablet that you wouldn’t have otherwise eaten. This cycle continues night and day. The blood sugar – insulin roller coaster leaves you feeling fatigued and hangry, often gaining weight due to fat storage effects of excess insulin. When the inputs of food and insulin are both large, it’s impossible to match the right amount of insulin to the food you eat. There is always a massive error! And the blood sugar swings are like a bad theme park ride. A couple of years back, I stumbled across a motherload of Food Insulin Index data in a University of Sydney thesis that I thought might hold some clues about how we could more accurately manage insulin. So I exported the data into a spreadsheet and started tinkering with it to better understand the relationship between the food we eat, our glucose response and the insulin we need. It’s not a great surprise for most people to see that our blood glucose response is correlated with the carbohydrate we eat. However, things get more interesting when we look at the insulin response to the food we eat. The Food Insulin Index quantifies the area ‘under the curve’ insulin response to a range of foods. Pure glucose is assigned a score of 100%, and everything else is measured relative to that. The food insulin index is a little bit like the Glycemic Index. However, rather than just measuring the maximum rise in blood glucose, the food insulin index measures the insulin response to the food we eat over time. Understanding our insulin response to the food we eat is much more useful for someone who cannot keep their blood sugars at normal levels due to insulin resistance (type 2 diabetes) or not being able to produce enough insulin (type 1 diabetes). When we plot carbohydrates against the Food Insulin Index, we find that, while high-fat foods such as bacon and avocado have a small insulin response, high protein foods (e.g. steak and fish) have a significant insulin response even though they don’t contain any carbs. People with Type 1 diabetes find that they need insulin to cover the protein they eat. However, the details of why and how much are often not well understood which leads to poor blood sugar control. Higher fat foods have a smaller insulin response, while low-fat foods (which are typically processed grain products) have a high insulin response. Although protein needs some insulin to help us build and repair our muscles and organs, higher protein foods tend to have a lower insulin response because they force out refined carbohydrates from our diet. Does protein turn into chocolate cake? When I first started looking into this issue, I thought the reason that protein requires insulin was because the glucogenic amino acids in protein were being converted to glucose which needs insulin. But I have since come to understand that it’s not quite that simple. Protein does not turn to chocolate cake in our bloodstream. I feel partially responsible for propagating that misunderstanding with my early posts on the food insulin index. Many people are avoiding protein to minimise insulin, and I’ve been trying to set the record straight. Insulin has many critical roles in our body. Most people are aware that insulin helps the body take glucose into the cells to be used for energy. The third, lesser-known function of insulin, is that it works to hold glucose in the liver (i.e. glycogen) for later use when we’re not eating. Type 2 diabetes occurs when we become resistant to the effects of insulin, and stored glucose leaches out into our bloodstream. Similarly, Type 1 diabetes occurs when the pancreas can’t produce enough insulin to keep glycogen stored in the liver, and we see our blood sugars rise. Effective and efficient use of insulin in our body is critical to our metabolic health. Most of the amino acids that make up protein can be converted to glucose via gluconeogenesis, but converting protein to ATP it’s really difficult compared to just using fat and/or carbs. for energy It takes a lot of energy to convert protein to glucose (we use 6 ATP to yield only 2 ATP of energy!). So the body tends to look for other energy sources once you’ve consumed enough protein. That’s why you can quickly become full-on lean protein, but we always have a “dessert stomach” with enough room for carbs and fat which are much easier for the body to use for energy. Let me clarify this with a real-life example that is close to home. Pictured above is my wife Monica’s blood glucose response measured with a continuous glucose meter) to this meal of steak and veggies shown below. Over the first few hours after finishing the meal the carbohydrates in the veggies digest and raise her blood sugars. Then the insulin that she injected with the meal kicks in and brings the blood sugars down. But then over a period of about ten hours, we can see that she is slowly metabolising the steak which requires insulin for the anabolic process of muscle repair. While the insulin is going to work on the protein, Monica doesn’t have enough insulin to stop the glucose being released into the bloodstream. You could be forgiven for thinking that protein is being converted to sugar. But it’s actually the glycogen in the liver leaching into the blood due to a lack of insulin. Monica actually needs more insulin here to enable her to build and repair her muscles as well as keep glucose in storage in the liver at the same time! Most people see their blood sugar decrease after a high protein meal due to the effect of insulin (the insulin released to metabolise the protein also brings the blood sugars down and keeps the glycogen shut in the liver). If you find that your blood sugars rise significantly after a high protein meal, it might be a sign that you actually need more insulin to ensure you are effectively using the protein you are eating. According to the Protein Leverage Hypothesis, (Simpson, 2005) rather than minimising protein, someone with diabetes eating less carbohydrate may actually require more protein. “One source of protein loss is hepatic gluconeogenesis, whereby amino acids are used to produce glucose. This is inhibited by insulin, as is the breakdown of muscle proteins to release amino acids, and therefore occurs mainly during periods of fasting. “However, inhibition of gluconeogenesis and protein catabolism is impaired when insulin release is abnormal, insulin resistance occurs, or when circulating levels of free fatty acids in the blood are high. Type 1 Diabetes guru Richard Bernstein says he found it hard to build and maintain muscle before he understood the importance of matching insulin with protein. However, after matching adequate protein with the right amount of insulin this is no longer a problem, even after more than seven decades of living with Type 1 Diabetes. At the same time though, there’s no point choking down more protein beyond what you have an appetite for. Regardless of the macronutrient source, there’s no use consuming more energy than you need, particularly as the errors in matching food with insulin can exacerbate the glucose/insulin rollercoaster. Anyone who is somewhere on the spectrum of metabolic disease needs to invest their limited supply of insulin wisely (e.g. to metabolise protein to build and maintain muscle and metabolise limited glucose from nutrient dense green leafy veggies) rather than squander it (on refined grains and sugars). I hope this interlude into protein metabolism gives you an insight into why a good understanding of our insulin response to protein is important. While there are a wide range of other hormones that drive our metabolism (e.g. mTOR, leptin, ghrelin and PPK) most of these fall in line if we optimise insulin and blood glucose levels. As a general rule, indigestible fibre does not require insulin and does not raise blood sugar levels. High fibre foods such as All Bran and navy beans tend to have a lower insulin response due to their high indigestible fibre content. Hence, it appears that a ‘net carbs’ approach makes sense, at least for whole foods. Fructose (a.k.a. fruit sugar) is processed in the liver without requiring insulin. However, some of it is converted to glucose via gluconeogenesis. Analysis of the food insulin index data suggests that 25% of the fructose we eat requires insulin. However, this is typically such a small component and difficult to calculate, so it’s generally not worth worrying about. After playing around with the Food Insulin Index data for a while, I found we can more accurately predict our insulin response to the food we eat when, in addition to carbohydrate, we also consider the effect of indigestible fibre and protein. With this improved understanding, we can then develop these formulas to calculate the insulin load and the percentage of insulinogenic calories. Understanding the insulin load of our food helps us to more accurately calculate the insulin people with diabetes would need to inject, including for protein. Or conversely, it can help them make better food choices so their pancreas can keep up and maintain healthy blood sugar levels. Being able to calculate the proportion of insulinogenic calories allows us to identify the most ketogenic foods that will elicit the smallest insulin response in our pancreas. Understanding the percentage of insulinogenic calories can be beneficial for people who require therapeutic ketosis to help with the management of cancer, epilepsy, Alzheimer’s or dementia. With better food choices that require smaller inputs of insulin, we are able to smooth out the blood sugar-insulin roller coaster. This is a big deal for someone with Type 1 diabetes. However, the same principles apply to anyone on the spectrum of metabolic disease (which is a growing portion of the population). I believe our first priority should be to normalise blood sugar and insulin swings. Often satiety and weight loss will naturally follow as we are able to access our own body fat more efficiently and are not driven to eat by fluctuations in blood glucose and insulin. However, after looking at the foods that elicit the smallest insulin response, I realised we may have another problem. The least insulinogenic foods tend to be mainly fat! While an unnecessary fear of fat has driven the unfortunate low-fat processed food saga that has been in place for most of my lifetime, I think we also need to acknowledge that the highest fat foods typically do not contain a lot of the essential vitamins and minerals. This chart shows the nutrients contained in the fattiest foods as a percentage of the recommended daily intake for each of the essential nutrients. The nutrients are then sorted to identify which nutrients these foods fail to provide in adequate quantities. Rather than sorting by percentage fat, this chart shows the nutrients contained in the most ketogenic foods using the percentage insulinogenic calories formula shown above. While these foods (refer summary below) are an improvement on the nutritional profile of the fattiest foods, they still do not provide the recommended daily intake for about a third of the essential nutrients. So the next question is, what can we do to maintain low insulin levels and while still getting the micronutrients we need? Building on the work of the likes of Dr Mat Lalonde and Dr Joel Fuhrman I developed a nutrient density index to identify foods that contain more of the nutrients that are harder to find. Dr Lalonde’s nutrient density system considered all the essential nutrients in terms of nutrients per weight of foods and ended up with a very protein heavy (e.g. 60 to 70% of energy) array of foods. Dr Fuhrman’s Aggregate Nutrient Density Index considered vitamins and minerals (but not amino acids or essential fatty acids) along with a range of other factors as noted below. The following nutrients were included in the evaluation: fiber, calcium, iron, magnesium, phosphorus, potassium, zinc, copper, manganese, selenium, vitamin A, beta carotene, alpha carotene, lycopene, lutein and zeaxanthin, vitamin E, vitamin C, thiamin, riboflavin, niacin, pantothenic acid, vitamin B6, folate, vitamin B12, choline, vitamin K, phytosterols, glucosinolates, angiogenesis inhibitors, organosulfides, aromatase inhibitors, resistant starch, resveratrol plus ORAC score. Rather than prioritising all nutrients, I think we only need to worry about boosting the nutrients that we are currently not getting enough of. To reduce any percieved bias or conflict of interest, my version of the nutrient density index only considers the essential nutrients that have established targets. While there are many other nutritional parameters that are nice to have (e.g. phytonutrients, lycopene, lutein, zeaxanthin, phytosterols, glucosinolates, organosulfides, resistant starch etc. ), they tend to come along for the ride if we focus on getting the essential nutrients from whole foods. Unfortunately, we currently only have data for the nutrients that are actually in a food. Hopefully one day we will also be able to account for your digestion, the effect of anti-nutrients and the bioavailability of nutrients from different food sources. Most of the time these are not a problem as focusing on nutrient-dense foods eliminates most anti-nutrients. Most people get plenty of amino acids, iron, zinc and vitamin A which are less bioavailability in plant-based sources. However, if you are consuming a 100% plant-based diet, you may need to pay extra attention to getting adequate of these nutrients. So, going back to the ketogenic foods, once we emphasise the harder-to-find nutrients, we get a massive boost in the micronutrient content of our diet, while still maintaining a ketogenic macronutrient ratio. The image below shows the ketogenic foods with and without consideration of nutrient density. When we boost the harder to find nutrients all of the nutrients get a significant boost. The nutrient score that you see on each of these charts enables us to compare the nutrient density of each these dietary approaches quantitatively. While the recommended daily intake levels are not set in stone, and your body doesn’t flip an on/off switch once the minimum levels are achieved, I think we ideally want to meet the recommended intake levels for as many nutrients as we can. However, there’s probably not much use chasing more than twice the recommended daily intake levels. So, if we filled the whole red rectangle, we would get a perfect score of 100%. As you’ll see below, we can create a theoretical list of foods that get us pretty close to a perfect nutrient density score of 100%. However, in real-life, it’s hard to achieve such a high nutrient density score. Dr Rhonda Patrick currently holds the top position on the Nutrient Optimiser Leaderboard with a score of 82%. If we tweak the weightings in the multi-criteria analysis and put less emphasis on insulin load and more on nutrient density we get a more nutritious group of low carbohydrate foods and the nutrient score increases from 64% to 97%. A summary of these foods is shown below. While I could go on about the importance of the various vitamins, minerals and fatty acids, the thing I see most regularly with low carb diets is a lack of alkalising minerals such as potassium, magnesium and calcium. The chart below shows a typical nutrient profile for someone following a ketogenic diet. Notice the cluster of lower levels of potassium, magnesium and calcium at the top of the chart. There has been a lot of talk about sodium lately. However, it seems that these other minerals are actually harder to get in sufficient quantities. Dr James Dinicolantonio references this study in his recent book, The Salt Fix, that shows that low sodium diets tend to lead to insulin resistance. The kidneys call on the pancreas to secrete more insulin to help them hold onto sodium when there isn’t much coming in from our diet. Volek and Phinney point out that the fundamental problem with low salt diets is that they cause a loss of potassium which is critical for building and maintaining muscle. Managing sodium and potassium is a massive deal for our body, with 40% of the body’s energy and 70% of the brain’s energy used just to manage the sodium-potassium pump that is fundamental to our energy production. As well as for sodium, the body upregulates our basal insulin to hold on to other electrolytes such as potassium and calcium. Ironically, a low carb or ketogenic diet that minimises total carbohydrates in an effort to reduce the bolus insulin required for our food, may actually lead to a reduction in electrolytes that drives insulin resistance through an upregulation of basal insulin to enable our kidneys to hold onto precious electrolytes if we’re not getting sufficient quantities from our diet! Paul Jaminet points out that Palaeolithic diets were naturally high in potassium and low in sodium. Salt was rare and highly valued, so we evolved mechanisms for protecting against the threat of low sodium levels. However, because potassium was plentiful back then, we have not developed similar evolutionary mechanisms to protect us against low potassium levels, even though they are every bit as devastating to our health. Today, potassium tends to be hard to obtain from our diet or even from supplements (which are limited to 99mg when the RDI is 4800mg or nearly 50 capsules), so we need to pay particular attention to make sure we get enough of it. While I don’t think it’s ideal to focus on just one nutrient, we get a respectable amount of nutrients if we just chase high potassium foods. And while there are a number of fruits (like bananas) in the high potassium foods list, there are still a ton of non-starchy veggies if you need to manage your blood sugar levels. Once you have normalised your insulin and blood sugar levels to that of a metabolically healthy person, there may not be any use in doubling down on more dietary fat if your goal is to lose body fat. If your goal is further weight loss, I believe the ideal approach is to maximise the nutritional content of your diet so you can minimise energy intake without risking nutrient cravings. The image below shows how the weight loss phase of a ketogenic diet includes a substantial amount of fat coming from the body with a more modest dietary intake of fat and lower overall calories. Foods with a lower energy density (in terms of calories per weight of food) tend to be more filling and allow you to reduce energy intake naturally which will, in turn, allow your body fat to be used for fuel. These weight loss foods prioritise low energy density while also prioritising nutrient density and a low insulin load to help you lose weight if your blood sugars are still a little elevated. And they contain a very respectable amount of nutrients. Meanwhile, the foods in this list just prioritise a low energy density and high nutrient density and hence provide a lot of nutrition without too much energy. And the nutrient profile is spectacular! A Protein Sparing Modified Fast is often used in weight loss clinics to maximise the rate of fat loss while ensuring you get adequate protein to maintain your lean muscle mass. Adding nutrient density to this protocol will further improve your chances of success by avoiding cravings and nutrient deficiencies while maintaining an aggressive energy deficit. What I find really interesting here is that, even though we are not prioritising any of the amino acids, we are getting tons of protein! It seems that when we focus on the harder-to-find nutrients, protein becomes a non-issue. It’s also interesting to note that the macronutrient split of these the most nutrient dense foods is similar to the macronutrients that generate the lowest ad lib energy intake. Conversely, actively avoiding protein tends to have a diabolical impact on the essential vitamin and mineral content of our diet as shown in the chart of the lowest protein foods below. As you can see from the food list below, it’s hard to minimise protein without going very high carb or relying on a lot of refined fats. If you’re a bodybuilder trying to build muscle you can focus on boosting the more anabolic branched chain amino acids (i.e. valine, leucine and isoleucine). The foods listed below will help you recover and build muscle if you are working out. If you are an endurance athlete who doesn’t want to rely on pasta and energy gels to get enough energy you can focus on high energy density foods while still keeping nutrient density high. Foods with a higher energy density are not as nutrient dense. However, these foods are still pretty good. … and the most nutrient dense foods is dramatic! A low carb diet will ensure that you avoid the majority of these dangerous Franken foods along with the sugars, seed oils, anti-nutrients and chemicals that are often associated with processed grains. However, what I’ve found, after playing around with all these food lists for a few years, is that everything seems to work out pretty well when we start by prioritising the harder-to-find micronutrients and tweak from there to suit our goals. A further problem that I identified with these lists is that they do not consider what YOU are currently eating. Each person’s interpretation of a low carb, ketogenic or paleo diet will vary depending on preferences, finances, culture, appetite and activity levels. which foods will provide you with more of the nutrients you are not getting from your diet right now? which new foods you should look for next time you go shopping. Rather than adopting the Pete Evans diet or the Tom Brady diet for a period and then falling off the wagon once the meal plans run out, the Nutrient Optimiser will help you help you make continual incremental improvements in your journey towards optimal nutrition. The algorithm takes your food log, entered in Cronometer, and analyses it to see which nutrients you are currently not getting enough of. We also look at the critical ratios to make sure we’re not prioritising nutrients that are going to exacerbate any current imbalances. The chart below shows an example of how we can use these ratios to refine the nutrients we want to prioritise. Omega 6 : Omega 3 0.3 < 4 omega 6 : Omega 3 ratio is good. Zinc : Copper 7 8 – 12 zinc : copper ratio is outside limits. Potassium : Sodium 1.5 > 2 potassium : sodium ratio is low. Calcium : Magnesium 2.3 < 2 calcium : magnesium ratio is high. Iron : Copper 11 10 – 15 iron : copper ratio is within range. Calcium : Phosphorus 0.6 > 1.3 calcium : phosphorus ratio is low. The Nutrient Optimiser algorithm also helps you choose your ideal dietary approach based on your blood sugars as well as our performance and weight loss goals. We can also factor in additional nutrients that relate to your current symptoms such as diabetes, low testosterone, fertility or a wide range of other conditions associated with nutrient deficiencies. The algorithm then generates a suite of personalised food sorted in descending order lists tailored and prioritised to suit your goals. And coming soon, optimal meals and meal plans that will align with your goals. The algorithm also gives a nutrient score for each day of your food log. You can learn a lot by reflecting on what you are consuming on your best and worst days. To date, I’ve run the Nutrient Optimiser analysis for about seventy different people. It’s exciting to see the competitive types try to work their way up the leaderboard. And if you’re a nutrition nerd like me you may find it interesting to head over to the leaderboard and drill down to see what each of these people is actually eating to achieve these high and low nutrient scores. Sitting in first place at the top of the leaderboard is Dr Rhonda Patrick who, as you can imagine, does look like she eats pretty healthy. But the best competition is against yourself, with incremental improvements by implementing the recommendations of each iteration of the Nutrient Optimiser analysis. For example, we can see Andy Mant has made leaps and bounds in his diet in preparation for his recent Paris wedding. Andy had some great success with plenty of seafood and oysters (check out his report here). Meanwhile, people like Amy boost their nutrients with organ meats on a zero carb approach. Others achieve a high level of nutrient density with plenty of green veggies. The Nutrient Optimiser still doesn’t force you to eat specific foods but allows you the latitude to find the best selection of foods that align with your preferences. If you’re interested, all the food lists (and a whole lot more) are available for free here. If you want to learn more about the Nutrient Optimiser you can check out the FAQ over at NutrientOptimiser.com. There are also a number of Facebook groups where you can participate in the discussion about Optimising Nutrition and share the journey. The Optimising Nutrition group is a bit of a hive mind think tank discussion and assimilation of nutrition-related research. The Nutrient Optimiser Facebook group has been set up to nurture people who are on their journey refining their health and nutrition using the Nutrient Optimiser. … or by following Optimising Nutrition on Twitter. I presented the guts of this article as a presentation at Low Carb Down Under Gold Coast in October 2017. A frequent comment was that it was apparent that I had spent a LOT of time developing the food lists and the Nutrient Optimiser. Yes indeed, this has been a labour of love. A challenging problem to solve with personal ramifications. I would love to see the Nutrient Optimiser take off and help a lot of people and perhaps pay for a little of the time that I have invested into it. Getting some income will enable it to be developed into a quality system that will help a lot more people. But I really do hope that the system that I have developed will educate people to start an underground revolution by enabling them to confidently make food choices that provide them with the nutrients they need with enough energy while also optimising their hormones. Decades of epidemiological studies have been fruitless in providing a clear direction as to the optimal human diet. Nutrition research and education are so fraught with entrenched belief systems, confirmation bias and with conflicts of interest. It’s impossible for the everyday person to know what they should eat to feel OK and thrive at life. It seems Big Food is just winning and Big Pharma (also owned by the same companies) is making a killing cleaning up the mess. The current system is broken and needs to change! The Nutrient Optimiser algorithm gives us the chance to redesign and rebuild nutrition from the ground up. My dream is that it will empower educated enthusiasts, then dieticians and personal trainers, then doctors, then insurance companies and then medical systems. At that point, big food will catch on and realise they need to provide nutritious foods that enable people to thrive and win at life. So how can I make a one-time donation to your efforts? Your charts are very helpful. Particularly putting the dietary fats in their place. We get sidetracked with charts that only apply to athletic men. Thanks for this. Useful and informative. Measurement precedes implementation. Taking iterative approach to optimization. Thanks for clarifying parameters. arty thanks for your post which i enjoyed reading. I have a question, well a few actually:-) but i will begin with one. In your post you state that insulin load, nutrient density, energy balance are the important factors. Managing insulin load is important for someone who already has some level of metabolic syndrome (I.e. !many people). However if your blood sugars are great then you can just focus on nutrient density and manipulate energy density to suit your goals (weight loss vs energy for activity). The cool thing is that nutritious foods are typically not highly processed and insulingenic so the insulin load looks after itself.